I’m a bit in love with aubergines at the moment and this is just so comforting and flavourful. It’s a great meat free dinner and is super satisfying but not too heavy. Don’t skip out on any of the ingredients, each one adds that little something! Start by cutting your aubergines in half and slicing a grid in the middle of each side. Then use a small knife to cut around the grid and then scoop out the little cubes. Add the aubergine shells, cubes and the vine tomatoes to a baking dish and drizzle with olive oil, salt and pepper. Roast it all at 200’C for about 20 minutes. Add the quinoa and stock to a small saucepan on medium heat and pop the lid on. Cook for about 10 minutes until all of the liquid had been absorbed, then fluff with a fork and take it off the heat. Pop the lid back on and set it aside to steam. About 15 minutes in to the roasting time, chop your onions and garlic. Heat a glug of olive oil in a pan on medium heat and add in the onions, garlic, pine nuts and dried herbs. Cook for a few minutes, stirring regularly, until the onions are soft. Take the cubed aubergines and tomatoes out of the oven and add them to the pan with the quinoa, basil and spinach. 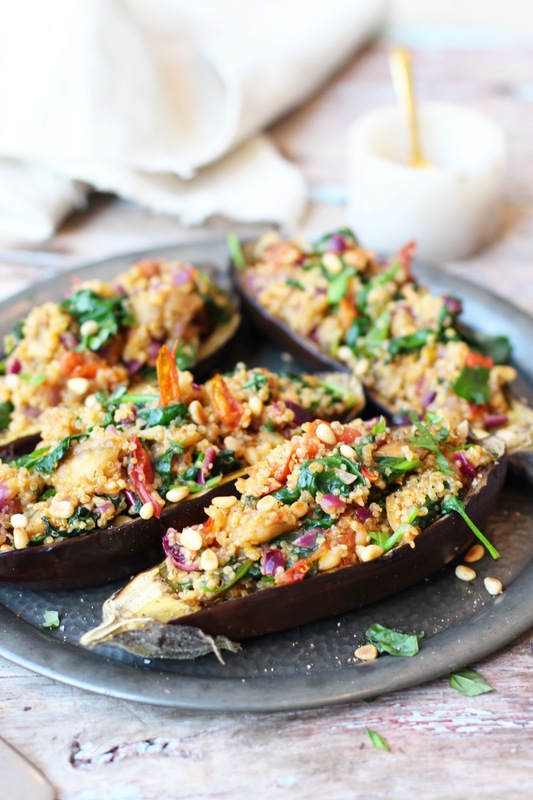 Pop the aubergine shells back in the oven for another 10 minutes, or until cooked. Cook everything in the pan, tossing regularly, until the spinach has wilted, then set it aside. Take out the aubergine shells when they’re nice and soft and have started to brown (about 30 minutes of total cooking time). Pile the quinoa into the centre of the aubergines and serve. 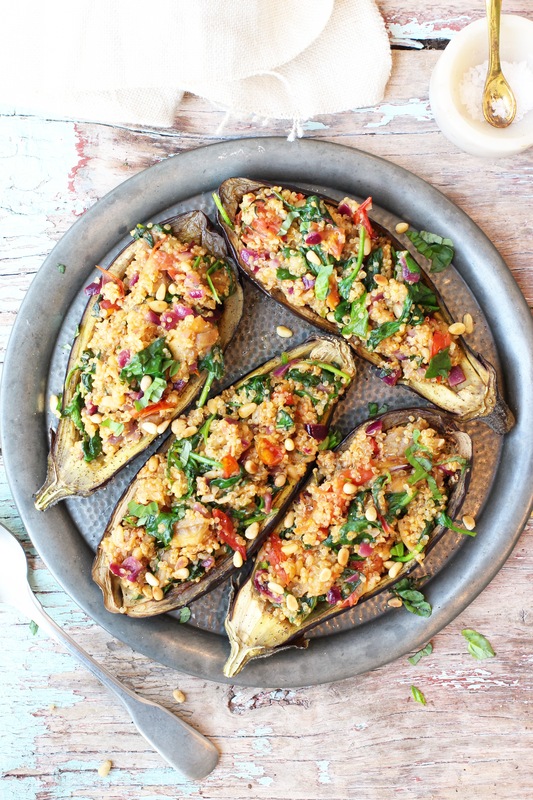 If the quinoa has cooled before the aubergines are ready, you can pop it all back in the oven to heat through. It’s also delicious with a drizzle of my Lemony Yoghurt Sauce.